During the air compression process moisture, oil, debris, and other materials (we’ll call them contaminants) are blown into the tank (sometimes called the receiver). To prevent these contaminants from reaching the machinery, several methods are used. The first of these methods, and the subject of this article is the piping itself and components installed in this piping. 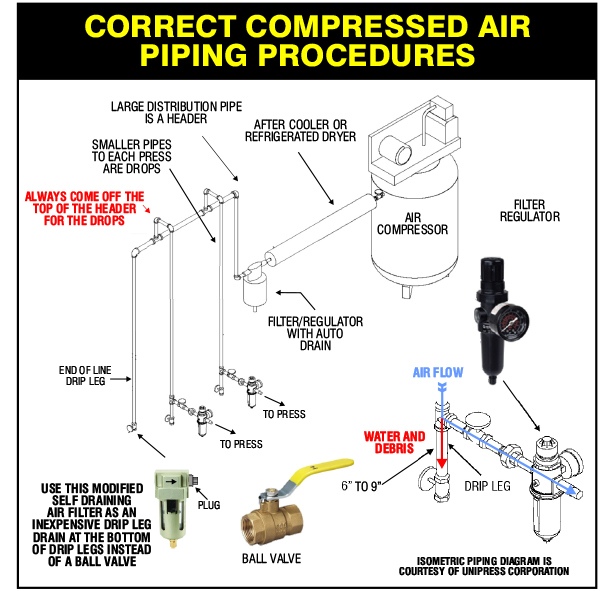 There are two physical forces employed in removing water and debris from the compressed air stream. Gravity and inertia, of the tendency of objects to keep moving in a straight line at constant velocity. Follow along using the accompanying illustration. GRAVITY- Notice first that the large pipe called a header is connected at each machine by branches called drops, used to supply compressed air to each individual machine. When designed properly the drops are taken off the top of the headers. Since water is much heavier than air it runs along the bottom of the header, pushed along by the flow of the air while the air flows along the top. Thus, gravity provides an effective additional stage of separation. I’ve seen many installations where the drops were taken off at the bottom of the headers literally capturing and forcing water and other contaminants down into the machinery; a very unhappy situation, causing machine performance nightmares. At the end of the airline it is always beneficial to have what is known as a “drip leg.” A drip leg, in its simplest form, is nothing but a vertical piece of pipe used to collect and retain water and debris in the compressed air system. INERTIA- Any remaining contaminants in the compressed air are moving rapidly along through the headers and drops. Because of inertia they want to keep moving in a straight line. An abrupt change of direction in the drop is created by inserting a tee and piping the air flow to the machine from the side of the tee. The lighter compressed air makes the 90 degree turn out of the tee while the contaminants continue moving in a straight line and are captured in the drip leg. A combination of components after the tee provide the remaining pathway conducting the compressed air to the machinery. A ball valve is used to shut off the compressed air flow from the drop to the machine for maintenance and a combined filter/regulator provides another stage of contaminant removal along with filtration and air pressure regulation. Draining the drip legs can be done manually with a simple ball valve or automatically using a device known as a “drip leg drain.” I use an inexpensive air filter purchased from Harbor Freight, Item #68279 plugged at the outlet side as a drip leg drain. I’m aware that in almost all cases the piping for the machinery already exists and you’re not going to get into replacing it because of this article. However, look at the diagram in the lower right of the illustration. It is very easy to just re-pipe the section at the end of the drop to the machine. Use soft copper tubing and compression fittings from the drop to the machine. Just having this section done properly will eliminate a great many problems. That’s it for now. 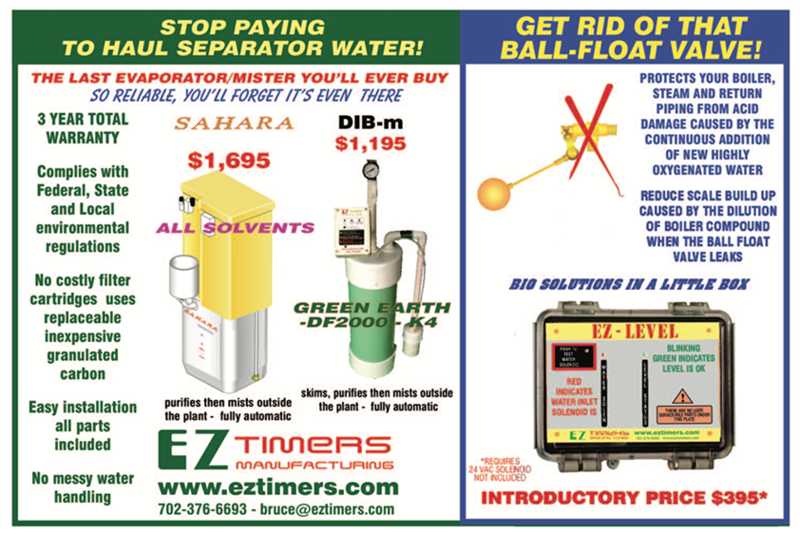 Our next article will be about removing moisture from the compressed air system. Call me at (702) 376-6693 if you have any suggestions. I am always delighted to hear from readers. © 2018 by BRUCE GROSSMAN all rights reserved under International and Pan American copyright conventions.